As South African President Nelson Mandela continues to battle a lung infection, actor Idris Elba hopes to immortalize his legend in the trailer for the new movie, MANDELA: LONG WALK TO FREEDOM. You're probably thinking the same thing I am: 1) Yummmmm...Elba, and 2) Wait, Elba doesn't really looking like Mandela (like, at all). But it's not really mandatory that the actor looks identical to the real-life person he's portraying (though it does help us separate the actor from the role he's playing). In any case, Elba steps into Mandela's big shoes, to hopefully help illuminate a side to Mandela that we haven't seen in the several adaptations that have come before it (Invictus, the on again/off again Winnie movie, etc). Judging from the trailer, it looks like Elba's certainly got the accent down, despite his obvious physical differences from Mandela), and he is just the type of actor--other than Morgan Freeman--that could dramatize some of Mandela's key speeches. MANDELA: LONG WALK TO FREEDOM is based on South African President Nelson Mandela’s autobiography of the same name, which chronicles his early life, coming of age, education and 27 years in prison before becoming President and working to rebuild the country’s once segregated society. 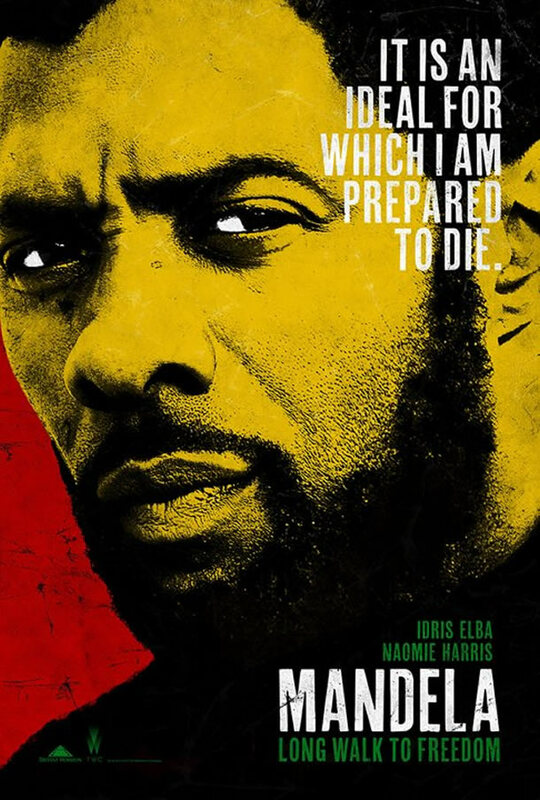 Idris Elba (PROMETHEUS) stars as Nelson Mandela with Justin Chadwick (THE OTHER BOLEYN GIRL) directing. I've never seen The Other Boleyn Girl, though I've heard nothing but great things about it. But I know that Chadwick's last film, The First Grader, about an 84-year-old Kenyan man who went to school for the first time, was also a critical darling (and is now available on Netflix instant). It may have been just the movie to propel Chadwick to next helm a film like MANDELA: LONG WALK TO FREEDOM. So he's definitely an auteur to watch. William Nicholson, who penned last year's Les Misérables, wrote the script. The film's other big name (or one that should be) is Naomie Harris (Skyfall, 28 Days Later), who plays Mandela's strong and loyal wife, Winnie. She's always excellent, so I can't wait to see what she brings to the role. Check out the trailer below and let me know what you think in the comment box. MANDELA: LONG WALK TO FREEDOM hits theaters November 29th. I've been waiting for Elba to break out big in a role, and hopefully this is it.